I sometimes check the local auctions… just to see if Tibet or Younghusband Mission related items come up on the market. There have been a few over the years, but have all sadly been beyond my meagre pocket. Its always an interesting browse however, as you would be amazed by the tat that some people try to sell, or that auctioneers deme valuable. If you ever wanted to coat your furniture entirely in formica, or collect small china cats, the local auction house is the place to go. 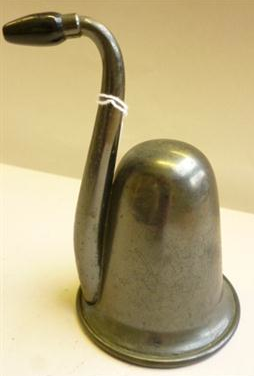 Anyway, this item ticked my fancy… its not especially ascetic, and I am unsure of its practical use, but it’s a must for any collector of tat, clutter, and ornamentalia: A military issue ear trumpet by R.J. Dowling of London. (With military crows foot stamp, 12.5cm.) Priced at a very optimistic £40-£60 it can be bid for at the Bellman Auction House in Billingshurst. It does slightly beg the question… what sort of military fighting machine would need a military issue ear trumpet? Have our armed services been cut back to such an extent that we are now sending regiments of octogenarians to the front line… the comedy opportunity and value of this image is priceless… Her Majesty’s Brigade of Armed Mobility Scooters? The Massed Pipes and Slippers of the Welch Fusileers? The Coldshiver Guards? It’s all very well and good beating swords into plough shears, but you will have to make a lot of ear trumpets from an aircraft carrier.